Mr. Agata started his business career at Toyota Motor Corporation in April 1976. He was appointed to Managing Officer in June 2004 and Senior Executive Director in June 2008. In June 2011 he joined Toyota Industries Corporation as Vice President and in June 2013 he became President at JTEKT Corporation. Mr. Agata was born on April 26th 1953. He graduated from the University of Hitotsubashi, Faculty of Sociology, in March 1976. In January 2006, Koyo Seiko Co., Ltd. and Toyoda Machine Works, Ltd. merged to form JTEKT Corporation, a functional parts maker unparalleled in the world thanks to its solid foundation of Japanese "monozukuri" manufacturing technology cultivated through long years of experience in bearing and machine tool manufacturing along with extensive knowledge in the fields of steering, driveline components, etc. 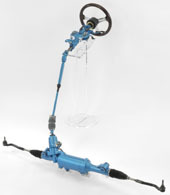 In addition to improving the output, feeling, quietness, and cost of electric power steering and other steering types, JTEKT has devoted itself to developing weight reduction technology in order to contribute to environmental protection with the aim of being the steering system supplier with the world's no.1 degree of environmental contribution. With the aim of being the world's no.1 automotive bearing supplier, JTEKT strives to grasp automakers' diverse needs at an early stage and develop bearings to meet them as well as to optimally combine its bearing and driveline unit technology. JTEKT provides Torsens, 4WD couplings and other driveline products excelling in safety, quietness, lightness and fuel efficiency with the aim of being the world's no.1 driveline system supplier. JTEKT, by taking advantage of its possessing steering, bearing and driveline component divisions, aims to lead the machine tool industry in quality and technology, contribute to customers' "monozukuri innovation," and be the machine tool system supplier with the world's no.1 technology. JTEKT seeks to contribute to the happiness of people and the abundance of society through R&D, manufacturing, and sales activities that win the trust of society. Regarding product development, JTEKT's mission is to supply environmentally friendly products excelling in fuel efficiency and efficiency and provide society with inspiration through products that are safe, reliable and pleasurable. By fully utilizing its product and manufacturing technology capabilities, JTEKT aims to provide the best in quality, technology and service based on concepts derived from the market, obtain the satisfaction and trust of customers, and fulfill its mission of contributing to environmental protection.